Etheria2 Painted Ladies ends tomorrow! Well Etheria2 has exceeded my expectations in so many ways, and it officially ends tomorrow at midnight. I wanted to again thank all the designers who participated, and encourage you to visit the event. You can still do so by clicking this link for a teleport directly to the event. I also wanted to thank the many, many bloggers who covered the event, you truly made it a success! I leave you with my own simple collage of the event outfits! 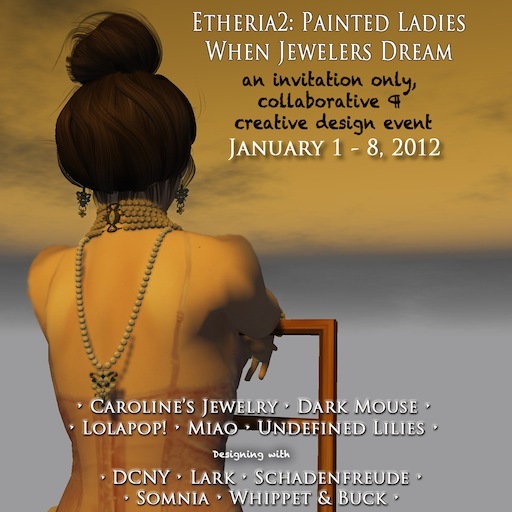 Etheria2: Painted Ladies is Open! One of the things that I enjoy most about Second Life is collaboration, I like the opportunity to work with people and to explore the various ideas that come up – sometimes those that are not possible in real life are the most exciting ones of all. Mouse Mimistrobell, Dark Mouse working with Sienia Trevellion, Lark! I am grateful and delighted by their participation! I invite you to visit their individual blogs for details on their wondrous creations, and here’s an LM to the event so you can visit and see them up close and personal yourself! Click this link to teleport directly to Etheria! In my own personal collaboration, I worked with Sienia Trevellion of Lark. I designed my own jewelry pieces around the ‘painted ladies’ theme, and it occurred to me that a painted lady would want to draw attention to herself. So I created a necklace that is sure to draw attention! I named it, “My Lady Love, and Sienia designed a dress that would accentuate the piece. The dress is called, “Bedroom Eyes,” and our intent was that the dress could be worn to evoke the feeling of the era, but would also have a modern feel. I hope you like, here’s some pictures of the items!